Vincent's newest is the first I'm happy with. I hadn't noticed before, but his shirt was nowhere near red enough. His feet still seem a little strange, though. The perspective makes them seem like his right foot is directly in front of his left. His right foot doesn't seem very well drawn, either. It's hard to tell how he's managing to stand up. Though he is supposed to be a comic character and, as such, isn't supposed to make complete anatomical sense, but at the moment he just looks weird. 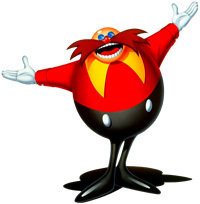 EDIT: Looking through Robotnik's Wikipedia page I realise that all Sonic art has given him blue glasses; even when he was the infamous Teddy Roosevelt caricature. I'd give him black glasses when using the sprite in Sonic 2, but I'd also remove the right hand completely, just like in the game. -Besides removing the hand, I've changed the lightning in his left feet to make it appear more like it's facing a bit towards the camera. Still not perfect, but I think it looks a little better now. -Also, the right leg's shape is now a bit more natural, and made his shoe less pointy. -Changed some shapes in and around his arm, adding stuff that appears in the original. -Changed the shape of his back sligthly since it's not perfectly round. -I noticed the line for his trousers was a bit too curve for the perspective, so I changed the shape a little. -I'd like to know your oppinions on the mustache's shape. I've tried to keep the original's shape while not adding too much detail to its shadows, so it looks more cartoony than realistic. -Also, regarding the mustache, it didn't have much shadowing in Sonic 2, so I think it should be kept simple... And I don't think it should have a black outline, since the original doesn't. That's it for today's suggestions. I've never been comfortable with that near foot. To what extent can one take certain liberties in 'correcting' the old art? This was a quick 30 second job (IE, just an example), but I drew more of a highlight on the top of his foot, just to show what I'm talking about. Maybe this could be made thinner, I don't know. That shading on the original is just weird. Also, where is that lightest shade of grey from, exactly (In the original sprite)? I included it, but I'm not so sure about it - his rump shines like that, but not his foot. Also, why are his feet nigh on the same size if one is pointing toward the 'camera'? I corrected this on my example. Yes, I know I made his near foot the wrong shape. Just an example, for somebody more talented to have a look at. I really like the new head, and I agree with love.self.hate's comments about the near foot. I don't really like the changes to his back, though. It looks like he's got a lump growing there, now. Maybe it's just an improvement that hasn't quite been perfected yet? I like ICEKnight's flatter head, I agree that it was previously a tad too large. I don't like ICEKnight's mustache colour though. I prefer the shading that Vincent gave it. To me at least the the cartoony feeling of the sprite is not at all harmed by the shading on the mustache. I think the mustache colour is also too red in ICEKnight's version (it looks to me almost the same colour of his shirt). Though you might be right about the black outline on the mustache being a tad intrusive. ICEKnight's mustache shape seems slightly better now (The left side in particular seems bushier and more even). And about the flatter back... it's very hard for me to say whether or not it's an improvement...maybe it is, slightly. A tough call I'll leave to others. *edit* should've used love.self.hate's foot image for this - see that person's pic for the feet issue. EDIT: Yeah, the mustache's color is too bright, but that can be fixed easily. You've done a great job with the shading on that new foot I think. I vote for the one on far right. It looks perfect to me. ICEknight, you said before that Eggman should be shaped like an egg, and now you're making his back flatter. You make his head smaller/lower than it's in the original sprite as well. Also, Vincent has done really nice shading on mustache, I don't see any good reason to change it. Considering the legs, again I think that Vincent got it right, the shading is the same as in the original. It's not just the shading, but the shape of the foot. In the original, the close foot is narrower and more distant from the other foot. Sometimes the original shouldn't be used as a pixel-by-pixel source. Sometimes limitations caused by the size of an object can change the shape of an object. 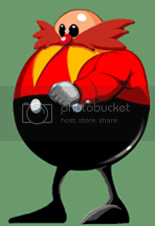 I think Robotnik's head should be a perfect circle, instead of a curve broken by a vertical line. That was a palette limitation, not a choice by whoever drew the original sprite, since unlike Sonic 1, Sonic 2 only has two shades of red. That looks awesome, though I do think it would look a tad better with the head shape ICEknight posted.